Balanced funds are quite popular these days but they are not always the best answer. The big selling point is their ability to reduce the volatility of your investment portfolio. Higher risk investments, such as individual stocks and equity mutual funds, can fluctuate dramatically. A stock market downturn can take years to recover. Low risk investments, such as bonds, also fluctuate, but not to such extremes. If you want higher income and are willing to take a higher risk of losing money, you would invest in equities. If you unwilling to take higher risk and the chance of loss, you would typically invest in guaranteed investment certificates or individual bonds. Never invest in equities (which includes balanced funds) if you want absolutely no risk of losing money – no advisor can offer guarantees on equity performance, nor are they legally allowed to do so! What if you would like a “balance” of equities and fixed income? In such a case, you have choices. You could buy some stock market investments, either individual stocks, an equity mutual fund or an Exchange Traded Fund investing in equities. You would also buy some individual guaranteed investment certificates, individual bonds, a bond mutual fund or an Exchange Traded Fund investing in fixed income. You would allocate your total portfolio between these two categories based on your feelings towards risk. “A balanced fund is geared toward investors who are looking for a mixture of safety, income and modest capital appreciation. The amounts that such a mutual fund invests into each asset class usually must remain within a set minimum and maximum. Do you have too much in a balanced fund? In certain cases, I do not think balanced funds are appropriate. First, if your entire portfolio consists of balanced funds, and you need to withdraw some money for living expenses for an unexpected expenditure, you still have risk. Consider this example. Assume that you own a balanced fund of $10,000 that contains 50% equities and 50% bonds. Assume that the stock market declines by 50%, as it did in 2008/2009. Assume also that the bonds do not change in value (but remember bond funds do, indeed, change in value. See my article Bonds Are Not Guaranteed-Understand the Difference between Bonds and the GICs). In my example, the value of your portfolio with decline by 25%. Your balanced fund would contain $5,000 of equities, that would have decreased in value to $2,500. The other half of your balanced fund would comprise $5,000 of bonds, which held their value. You would now have $7500 remaining from your $10,000 investment. If you need $5,000 to purchase a new car, and have no other resources to draw from, this $5,000 would come out of your balanced mutual fund. You only have $7,500 after the market crash, so you have $2,500 remaining after your withdrawal. This $2,500 would comprise $1,250 of equities and 1,250 of bonds, because it comprises a 50-50 balance. After withdrawal, assume that the stock market returns to its original position. Unfortunately, the $2,500 in your balanced fund would only return to $3,750. Your $1,250 of bonds would remain at the same value, and your $1,250 of equities increase to to $2,500. If instead of owning a balanced fund, you had owned two separate funds with $5,000 in an equity fund and $5,000 in a bond fund, you could have used a different approach. Assuming the same facts, your $5,000 equity fund would have declined in value to $2,500. You would still have only had $7,500 after the crash. However, to purchase your car, you would have used the money in your bond fund. After the purchase, you would have had $2,500 in equities and nothing in bonds. After the stock market recovery, you would have had $5,000 in equities and still nothing in bonds. However, at that time, you would rebalance, sell $2,500 in equities and buy bonds. You would be $1,250 better off. My point is this. Unless you have other money to draw from, a balanced fund still puts you at risk in a volatile market. You should always have a portion of your savings and investments in low risk money. You should have a standalone emergency fund holding 3 to 6 months’ worth of living expenses in a high interest savings account. In addition, any money that you expect to need for living purposes or major purchases within the next 7 to 10 years should be in a fixed income portfolio. This would typically be a laddered portfolio of guaranteed investment certificates or bonds, or perhaps a bond mutual fund or a bond Exchange Traded Fund. The fees that apply to the bond portion of your balanced fund are almost 1% higher than they would be if you held a bond fund separately. In my previous example of using a 50:50 allocation of bonds and equities within a balanced fund, you could save about 0.5% in fees by purchasing separate funds instead of a balanced fund. Why is there a difference? Perhaps it is because the mutual fund managers must constantly watch the fund and reallocate between bonds and equities based on market conditions. However, if you and your individual advisor are prepared to do this on your own, you could improve your performance. Or, perhaps it is because your broker is paid a higher commission to sell you a balanced fund instead of a bond fund. 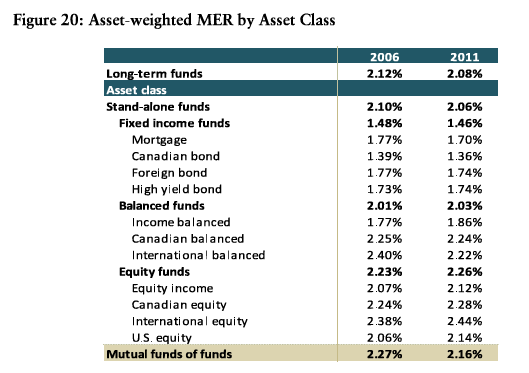 Another table from the same report shows that your advisor is paid an annual fee of 0.5% on a typical front-end load Canadian bond fund, whereas they receive 1% if you purchase a Canadian balanced fund or a Canadian equity fund. In other words, the commissions to purchase a balanced fund are higher than they are for a bond fund. The above table is based on mutual funds that the pay your advisor an ongoing fee. Special f-class mutual funds are used if you are paying your advisor directly. In f-class mutual funds, the trailer fees are eliminated because you are paying the fee to your advisor yourself. If you are paying your advisor directly, ensure that you have been sold the correct type of mutual fund so that you are not paying twice. If you are buying mutual funds, you should consider the above issues. Balanced funds do indeed reduce the volatility of your portfolio. However, owning separate funds will also provide the same impact assuming the same proportions of bonds versus equities. Separate funds will allow you the choice of from where to draw money when you need it, or when you want to change your investment mix. If bonds are down and equities are up, you can draw from equities; if equities are down and bonds are up, you can draw from bonds. And, of course, there is the difference in fees to consider.